It's fair to say that I have always been infatuated with flying. Purchasing a helicopter and the outlay for a licence was well beyond my budget so I started looking at an amazing little machine called the Gyrocopter. I was encouraged by a good mate of mine from Indiana station, David Bird (Birdy) to get involved in these unique forms of transport. 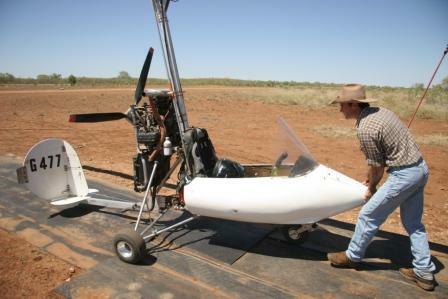 In 2007 Sarah, Braxton and myself moved down to Broken Hill, SA for a month to build my Gyro. I had master builder Ross Symes on the job and it didn't take us long to make and assemble my Rosco rolling frame. 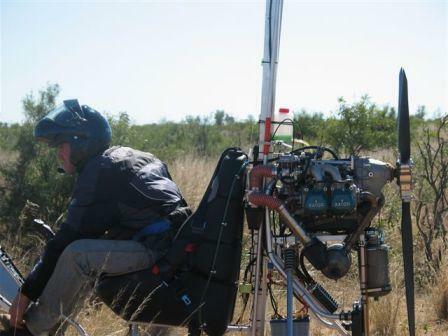 We then mounted the Rotax 912 ULS engine with a three blade prop intact. After building my horizontal stabiliser and tail rudder, control panel and bell crank joystick, we mounted the fuel tank (which is also the seat), all the plumbing and the main blades. All I had to do now was get my licence. I drove down to Lameroo, SA, to earn my stripes. My instructor was Kevin Traeger, a man that can pilot almost anything that flies. After four days of flying I received my licence.The National Gyro Championships was held at Lameroo, 2007, so I competed in the competition after just six hours of solo time. I was crowned the National rookie pilot after the completion of the events. Birdy and I flew our Gyro's from Lameroo in south-east South Australia, straight through the centre of our country to Indiana station (Alice Springs). Our journey took us four days during which we flew over the majestic Flinders Ranges across the edge of Lake Eyre and Lake Torrens. We crossed national parks, the Simpson Desert and landed in remote areas like William's Creek. From Indiana I continued my journey solo across the Tanami Desert to Suplejack Downs Station. I used my Gyro for various jobs on the station including mustering, bore runs, checking fences and the occasional Sunday stroll. My first Gyro 'the stead 'didn't live for too long. After just 200 hours I crashed, as a result of colliding with a large ant bed. All that was left was shrapnel of aluminium and engine parts splattered all over the bullock paddock. Unbelievably I walked away. It took me six months to regain my composure and purchase a second Gyro, this time it was a Subaru powered Gyro with a half pod. I used this machine for all station duties, right up until the day I broke my neck. She still sits in the hangar at Suplejack's airstrip. 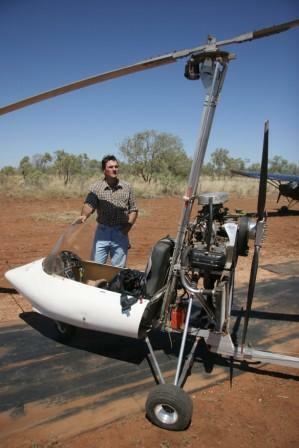 "Me and my machine - The second Gyro I used to muster on Suplejack Downs"